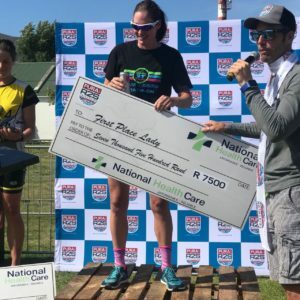 About a year ago, Paul Kaye made an announcement that had every competitive South African based triathlete sitting up in their seats and thinking ‘now this is an opportunity’… In September 2018, the world’s best elite and (affluent!) 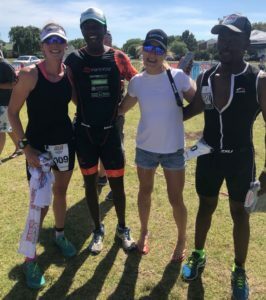 age groupers will descent on Port Elizabeth for the Ironman 70.3 World Championship, and from the minute I heard about it, I wanted to be included. After a couple of years of trying to race through illness, I wanted to get back in the game. I have been in the sport long enough to know you have good days and bad days, good seasons and bad seasons. Sometimes you are lucky. You can’t really change your luck but you can change your mindset, and in 2017 I’ve found myself making better choices, listening to my body before things start to break down, and really communicating better with my coaches. I guess that’s one big benefit of maturity. Race 2 Stanford was the final race of a really solid year, having made the podium in every event I’d started. It is set in the beautiful Overberg region – we all wanted to go to the event as a family – and I just had to hold myself together for one more day. Except. Mom! Can you study with me? What’s for dinner? Can we leave for swimming now? Can you wake me at 5am I forgot to do my homework? Plus the toughest one: Sorry, I just have to get this report out I’ll be home late. And so on. I realised if I want this to work, I have to reach out to my friends. Carol and Emile saved the day; I left my family behind to focus on myself for 24h and trusted my support crew with all the peripheral fluff. We did a quick drive over Shaw’s Pass the night before, to see if there were any tricky descents to be aware of. The uphill worried me less than the downhill- and I still had visions of unpredictable vehicle crashes that I tried hard to suppress. Race day started at a civilized hour, 9.15am in the clear blue Hermanus New Harbour. The swim was two 950m laps, and water temperature a comfortable 14C. 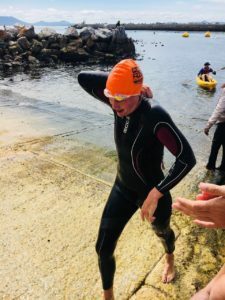 A slight current heading back to the shore on each lap, though I found sighting pretty easy and exited the water as 1st individual female (2nd behind Arne van Rensburg, Annah Watkinson’s ‘blonde brigade’ team mate). A slippery run out of the water – it’s not called a slipway without reason – and up the rise to T1, with AC/DC Thunderstruck blasting. That made me smile, as my youngest learnt the guitar part last year, so I was still thinking of him as I headed off on the bike. Knowing the bike course would be brutal, I took it very easy leaving Hermanus- a good thing as the tourists or locals seemed a bit surprised to see wet people racing bikes on a Saturday morning. 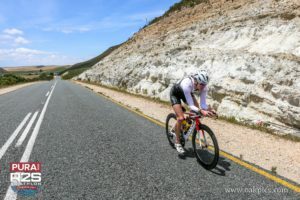 Once onto the Hemel en Aarde road, the gaps were opening up and I tucked onto my TT bars to dig in for a long and lonely ride. I’d heard that the prevailing wind would typically make the first 2/3 of the 90k cycle tougher than the return into Stanford. Mentally, when you expect pain, it’s usually more bearable. The climbs were as expected, I geared down and used them to eat and drink. The descents were a leap of faith. Good old faith returned – half a minute into the first stomach churning drop – when memory kicked in and I started riding harder to increase my stability- especially in the crosswind. Once we started rolling, up, down, it did not stop. My Garmin says 1500m of ascent, who really knows whose reading is truth? It was awesome, in any case. Until we started the rollers back to Stanford and found the prevailing wind wasn’t prevalent that day. Slog. Drink. Keep pedalling. Stay calm, everyone is suffering. On reaching T2, I heard that I’d stretched the women’s field and had at least ten minutes, maybe fifteen. Legs were heavy but not awful. My biggest problem was heat. I looked for shade, took in fluids (debating whether that was the right call, as I wasn’t thirsty, just hot). I took my time when I needed to. Breathed. Walked. Calmed myself as much as I needed. Three loops of not very impressive running. Moving along well at times, but no digging holes that take weeks to bounce back from. I didn’t put on a show, I got the job done. 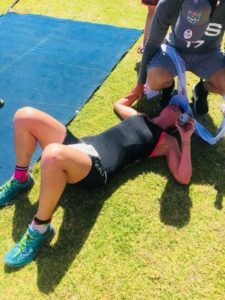 My 17 minute lead was cut down to 8 minutes at the end, by multiple Dusi and Otter Trail champ, Robyn Owen, taking part in her first ever Triathlon. In third place, youngster Gabriella Gioia, completing this event only five weeks after finishing 3rd in her age group at the Ironman World Champs. As exhausted as I was on the finish line, minutes later I was up for an interview, photos and absolutely fine to drive myself home. While out on the run course, I was already mentally preparing for Sunday’s grade 6 exam revision with my twins, and thinking ahead to slotting back into normal family life. I juggle an awful lot of things to make days like this work for me, it’s certainly a full life! I do pick my battles. Some races are a blur of continuous hard effort. Race 2 Stanford was more about consistently not burning my matches, holding myself back, savoring the surroundings and appreciating the support. I was able to just go out and have proper SWIM-BIKE-RUN-FUN! Tissink coaching once again delivered me to the start line in tip top form – it really is a privilege to be able to trust my training workload to others, so I only have to figure out how to get the sessions ticked. Lastly, a special mention to my family – they may not have been there with me on Saturday but the support is immense. They know how hard I work and what it means to me to have a great day out. They get me!